The Elan stairlift is the ideal choice for straight stairs. 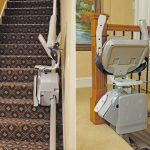 It is a high performing, affordable stairlift that is easy to use. 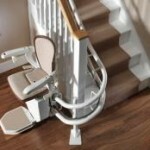 Installation is also quick and easy which means we can aim to install the stairlift within a few days. BM Stairlifts are official stockists of Homeadapt Stairlifts in Ireland. Homeadapt is the UK division of Bruno Stairlifts and Independent Living Aids, America’s largest producer of stairlifts.